Endurance and strength training have both aesthetic and health benefits, and if you want to stay active even after a workout routine, you must learn to supplement your body with the right amount of protein. When performing endurance exercises, the muscles get damaged and they become worn-out for a short period of time; in the long run, the muscles turn into an aerobic machine, but until that happens, they must be properly nourished. Leaving aside water, a post workout meal should also contain carbs and protein; however, you should stay away from eating fat because it slows down your digestion. Here are some further guidelines about including supplements into your diet after you’ve exercised. This substance occurs naturally in the cells of our muscles. When used as a dietary supplement to build muscle, this metabolite becomes creatine monohydrate used for cellular modulation and energy production. Creatine increases the cell volume of the muscles, promotes lean muscle tissue, increases glycogen synthesis and speeds up post-workout recovery. Athletes are advised to include between 5 and 10g of creatine into their diets when performing weight training. Beta alanine is a naturally occurring amino acid found in natural sources such as poultry. Supplementing your diet with beta alanine increases endurance, improves force output, enhances body composition, reduces fatigue and boosts performance levels in athletes and avid bodybuilders. Heavy lifters are advised to include 2-3 g of this protein into their diets before a workout routine, and an additional 2-3 g afterwards to help the body recover faster. 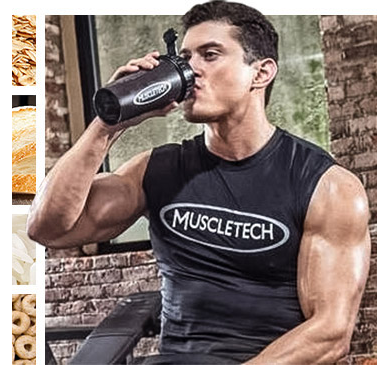 Whey protein is an extremely common type of supplement in athletes, trainers and bodybuilders. It improves performance and it helps develop lean muscle. Supplementing your diet with whey protein helps your body recover; it provides your muscles with an increased amount of protein, but also adequate quantities of minerals, calcium and magnesium that are easy to digest when taken in liquid form (shakes). Whey is recommended pre and post workout to boost muscle recovery. After an intense workout routine that involves a lot of heavy lifting, the body must find a way to repair itself. To do that, it must be properly nourished and protein is vital for repairing damaged muscles. Protein supplements and shakes are recommended in varied quantities; athletes are advised to consume between 30 and 40 g of whey before and after their routine. Glutamine is hailed for its ability to decrease muscle tissue collapse throughout demanding exercise routines. The substance helps improve strength and elevates an athlete’s endurance levels. Weight lifters will realize that glutamine will make them lift heavier weights for extended periods of time, provided that they train often. When taken in supplement form glutamine features a number of associated benefits. The amino acid preserves muscle tissue, thus allowing the body to burn extra fat. When the body has lean muscle, the metabolism becomes a lot more active and efficient. Bodybuilders and weight trainers are quite used to taking BCAAs. These amino acids are meant to improve your workout results; out of the body’s 21 amino acids, BCAAs are three: valine, leucine and isoleucine. Our bodies need them to recover; much like whey protein, BCAAs direct nutrients to the muscles, thus improving recovery. Taking BCAA supplements improves metabolic body recovery and diminishes pain from muscle exhaustion. There’s some proof that branch-chain amino acids can boost endurance by fueling the muscles. In long distance workout routines, this could mean a lot. Imagine how useful these supplements can be to distance swimmers and marathon runners. There’s no doubt that post-workout supplements are needed in order to keep the body recover properly after an intense routine. The market is packed with shakes and tablets meant to boost muscle mass and increase endurance; just to be on the safe side, why you should consult with a professional trainer or nutritionist before spending any money. By Edward Francis and Nuique.com!